We are a married couple with three fabulous dogs of our own. 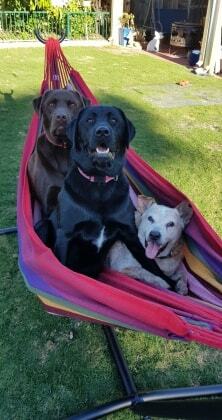 We have two very sociable young Labradors (chocolate male and black female) and a sensible older Red Heeler (male). All of our dogs are sterilised and vaccinated. We have a large fully fenced yard and a pool that our dogs use as they please. All of our dogs are inside dogs with free access to the yard whenever they want via 2 dog doors. I also own a hydro bath and can wash your dog before coming home if you like. We have always been involved in either fostering or animal rehoming. I have run a small dog washing business for 10 years and have previously worked in kennels. We also are home to a few chickens, a duck and some birds. All are part of the family to us. Be warned, any dogs that stay with us will be spoiled rotten and probably ruined for life! Please note, ALL male dogs must be sterilised. Dogs with aggression issues of any kind will not be accepted. This is not negotiable. All you need to send with your dog is their collar with a nametag, food, their bowl and if they are particular about their bed, send that. We have loads of toys for them all to play with. Mikelanne took Sookie as a last minute booking. I couldn't be happier with the love and care she showed Sookie. As for Sookie she is exhausted from her own fun weekend of playing! I wouldn't hesitate to refer Mikelanne's services to anyone! Thanks again Mikelanne! Dog Washer of 9 years. Sorry no grooming facilities.